Composition – What’s the big deal? Composition: What’s the Big Deal? If your goal is to make a piece of artwork that combines different elements, such as line, shape, tone, color, or texture …. which appears understandable and harmonious …. and provides satisfaction or pleasure to the viewer – it IS a big deal! If I were to ask you to compose a paragraph that was meaningful- you would have to arrange the letters, words, sentences and punctuation in a particular configuration for it to make sense. Even more thought would have to go into the paragraph in order to make it interesting and pleasurable to read. The same is true for composing a piece of artwork. Since before the Renaissance, art instructors at the Academies have taught composition as the basis for all other learning in the field. All students learned many mathematical diagrams that showed ways to divide up the surface of canvas in order to plan the composition to be the most pleasing to the eye. Two favorites were the Golden Mean and Golden Rectangle. Where lines proceed or intersect, or where spaces are surrounded by lines- these become areas of importance. 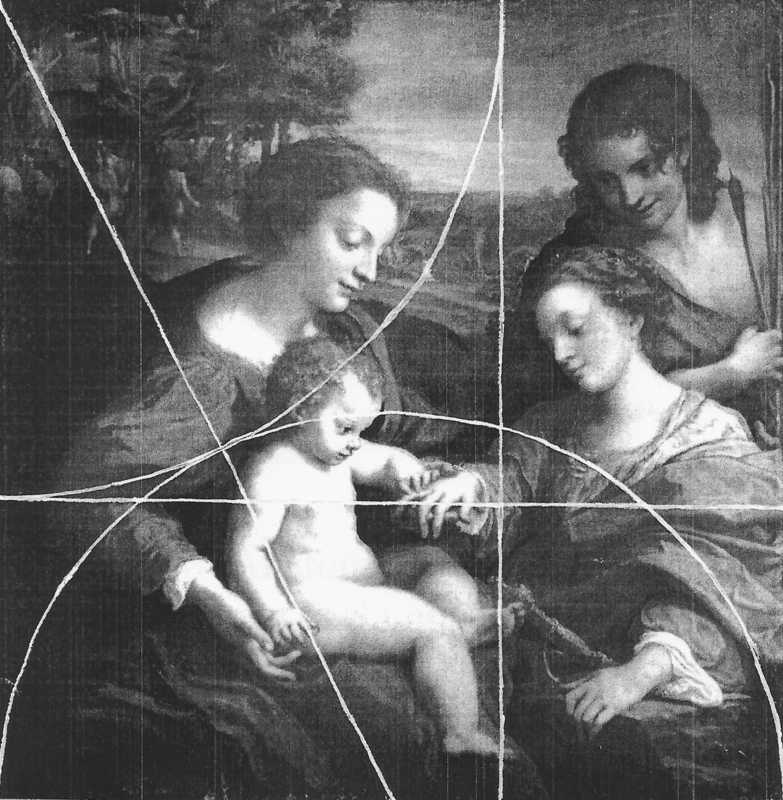 The Golden Mean diagram helped the artist decide where to place “focal points” (areas that draw or hold your attention) and “directional forces” (actual lines or lines of objects that attract your eye ) to guide the viewer around the entire composition. In the painting by Roger Frye, the main focal areas are circled (left). They contain interesting detail, color and texture. Therefore, they attract and hold attention. Sometimes dark tone will hold attention – so some will see the vase as a major focal area. Directional forces are lines, edges or “lines” of shapes that help guide our eye around the design. They are meant to keep you within the composition, not carry you toward the margins. I have noted only a few with arrows. You may see others. There are other important considerations. Mainly, variety and repetition. An interesting composition usually has a good balance of these two principles. 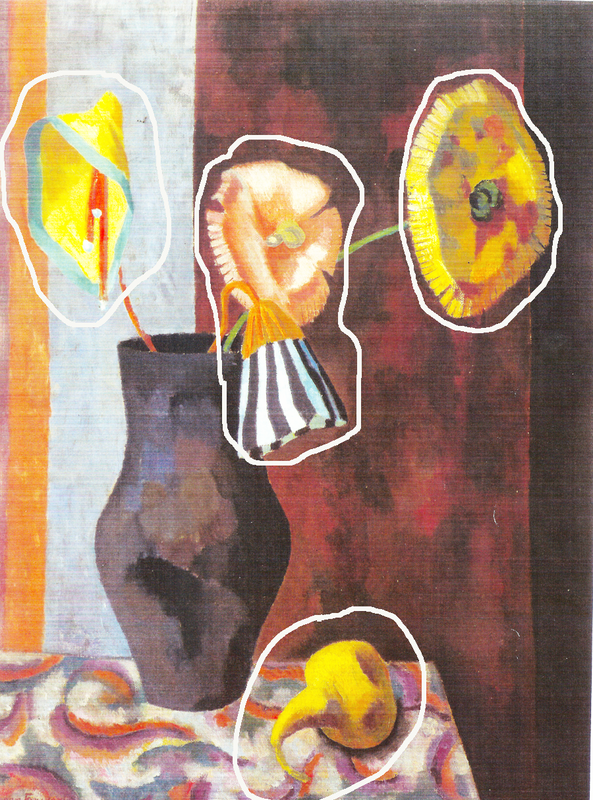 In the picture we have been looking at, there is variety in the flowers created for the arrangement. There is also repetition of the basic shape. There is another roundish shape – the pear – so that adds variety and adds to the repetition of shape. There is repetition of the various colors used in the composition, – a particular color appears in more than one part of the still life. The vertical segments in the background are also varied in width, but all are repeated verticals. The pattern on the tablecloth has variety in color and type of shape, and both are repeated. This variety and repetition was not an accident, but planned by the artist – who was a well-known artist and art critic – and a member of “The Bloomsbury Group” of artists and writers in Edwardian England. There are many more important things to think about when composing a design, but some of the most important have been mentioned here. Any basic design text will enlighten you further! This posting was written by one of C2C gallery’s artists, Abbey Fitzpatrick. Abbey is a local artist who recently retired as an adjunct professor from Grand Rapids Community College and Kendall School of Art and Design. I appreciate her taking the time to write this document on composition. What do McDonald’s drink trays and Cory McCrory have to do with one another?